It has been a while since I mentioned the Pebble Time. To be honest this is intentional. I had an issue with the first one they gave me, which was resolved by a replacement (more on that later). Now that I have had some time to use it in the real world for a while, we can dig into the review of this nice little timepiece. 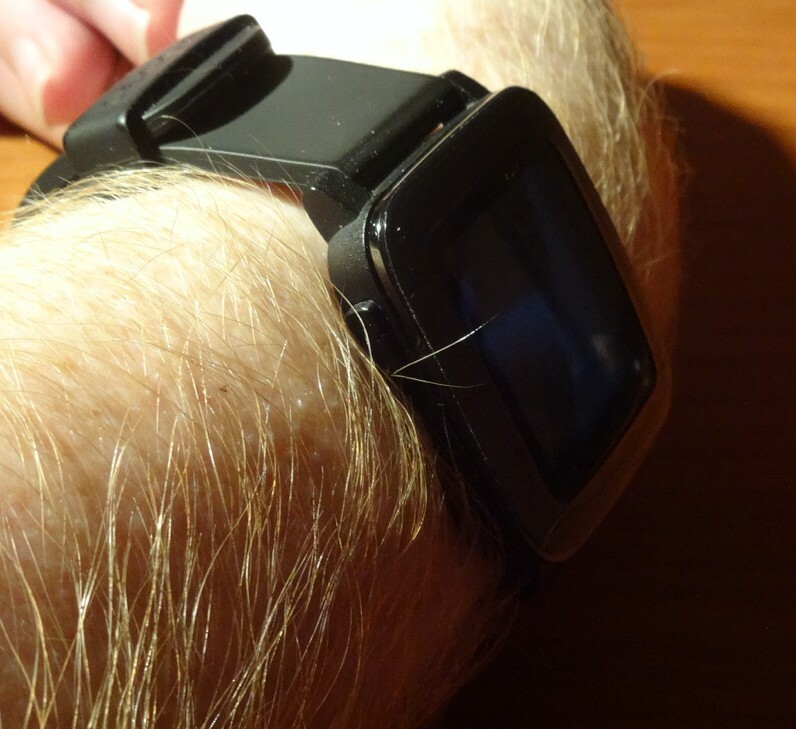 The Pebble Time is by no means the prettiest watch out there, but it isn’t trying to be. This is trying to appeal to those who need a smartwatch but don’t want it to scream “look I have bling on my wrist”. It does this really well, especially if you get the subtle black one that I have here. It’s also available in red and white and the watch is small enough to be mistaken for a normal run-of-the-mill Casio. It’s not until you look closely that you realise this a very different to the Casio forefather. 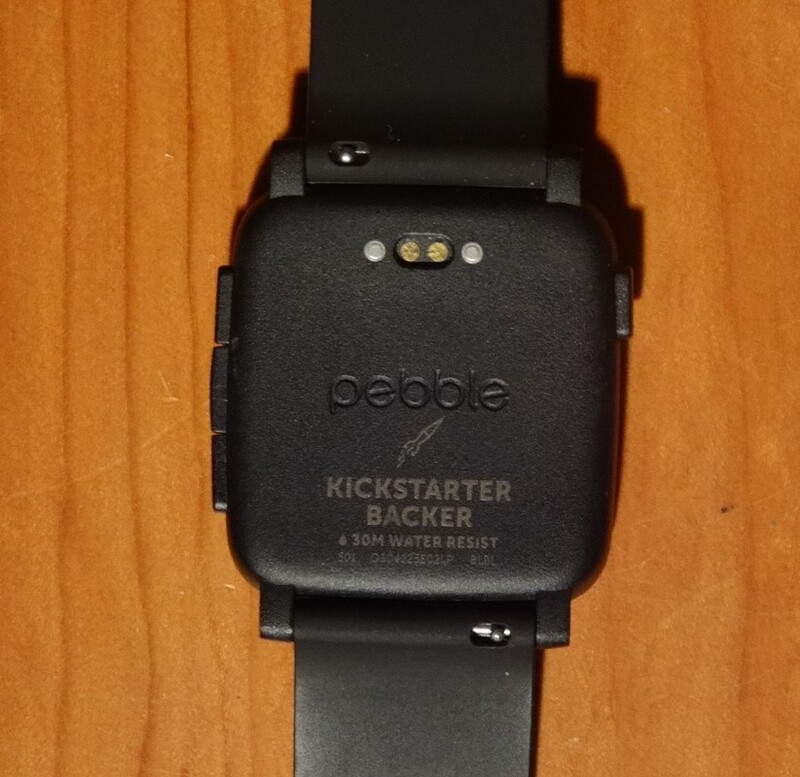 It has also dropped the childlike design of the first Pebble, at least in my opinion. Up front, we have a really nice clear screen that is clear in most conditions; especially as there has been a software update to allow more brightness control than on initial release. By all accounts, the glass used is Gorilla Glass 3, however I have seen evidence which means that this may not be the case. Scratches have been reported. The metal bezel surrounding the screen is also very prone to scratching and happens very easily. This is a shame and I do wish that Pebble had created a better way of protecting the bezel, as that means you then need to get some sort of protection. Going around the device we have a few different buttons. On the left hand side we a multifunction button. On the right, we have three buttons: an up and down plus one in the middle to select stuff. Around the back we have the magnetic charger port with pogo pins. There is also a inscription showing that this was a Kickstarter backed edition. The charger connection is a little bit fiddly and can sometimes physically disconnect, meaning when you pick it up after a night on the charger, it still needs to be charged. Having the physical button makes interacting with the device very easy and it is possible with a bit of practice to use them without looking. Each of the buttons does a different job depending on what you are accessing on the watch. I will go into this in a bit more detail in a hands on video. 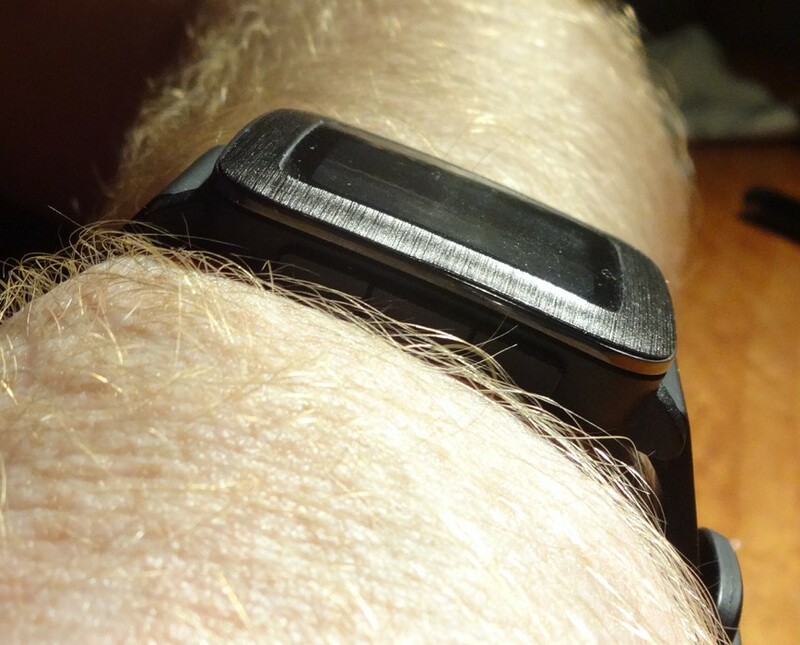 The standard Pebble Time comes with a silicone band which is pretty good but I am going to be replacing it soon. It is a dust and lint magnet, so it gets grubby very quickly. The casing has seals on it that are reportedly waterproof to 30m. I have yet to test this claim as I’m actually on my second watch due to the first one failing whilst I was in a bath. I have done some investigation and it seems that if you use the buttons whilst in water then you risk getting water into the device. Naturally, this does mean that I’m more hesitant to use it in water. It is fine when using in the rain or washing the dishes, etc. One thing I will say here is that Pebble were brilliant when it came to replacing the device and I got my replacement within a few days of returning my faulty one. Well done Pebble on that front. Overall the design is quite nice, and although it is not as striking as some of the other smartwatches on the market (something I feel is a benefit), it still stands out with its simplicity. The easiest way for you to understand how the software works is to show you a video running through the various facets of the watch. So without further ado, here is my software run-through. The watch is paired and setup using a dedicated Pebble Time app on either your iPhone or Android device. If you are using Android then you really need to install Android Wear to utilise the advanced functionality of voice control and custom text replies. This is slightly annoying as it should just be something that Pebble themselves integrate. But alas it is not, so we have to deal with this being levered in almost in a “hacky” way. Here is another video to show off the smartphone app UI. The Pebble Time is also a great way to get apps on your wrist and there are thousands and thousands of them out there. The main focus of the apps available is as a means to give you information at a glance. This is exactly what a smartwatch app should be. I haven’t put that many apps on my Pebble Time in all honesty, as I don’t really use it for the extra apps per se, but the ones I have on it are really useful. Take Evernote for example, as shown in the video. I work in a an environment where I need access to many systems. Now, all of the these systems require different passwords. Unfortunately I have a very bad memory and I need a record of my passwords. This is where Evernote and the Pebble Time work perfectly for me. It allows me to see my password at a glance, meaning my work flow is not interrupted too much. Simple things for simple minds, as they say. 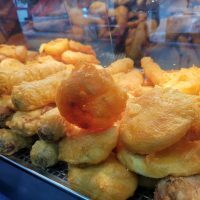 If however, you are someone who find that more apps are better, you will not be disappointed as the companion app and its store has many thousands to choose from. 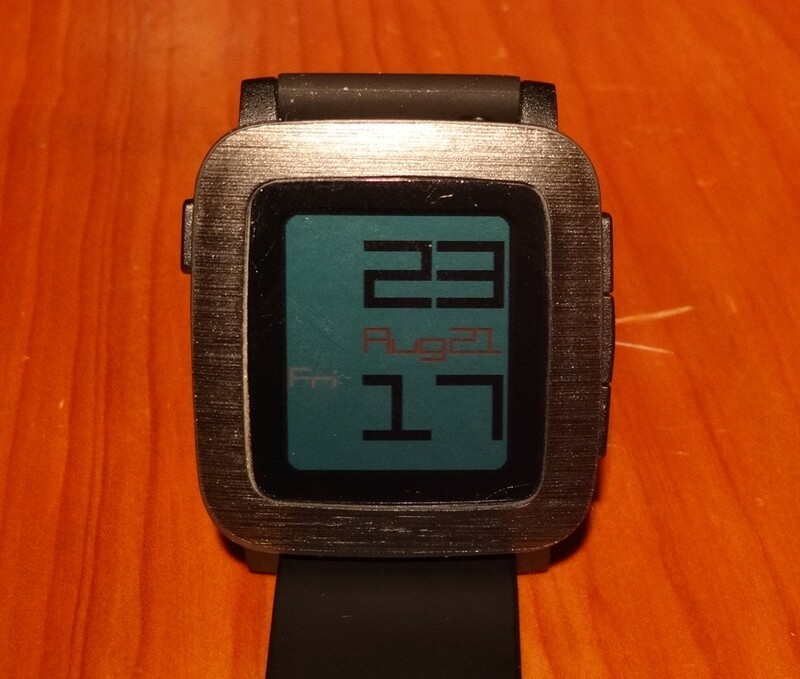 There also hundreds – if not thousands – of different styles of watch faces to choose from, including all the OG Pebble ones, so you can have a fully customised watch face with a few simple clicks. 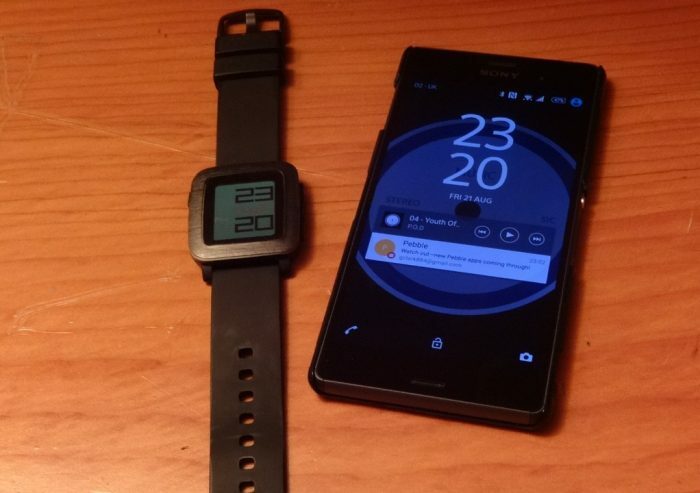 Is this the smartwatch that I recommend you rush out and buy right now? I think this is a good question to use to round off this review. But before we get to that, we need to address why you the user want a smartwatch? 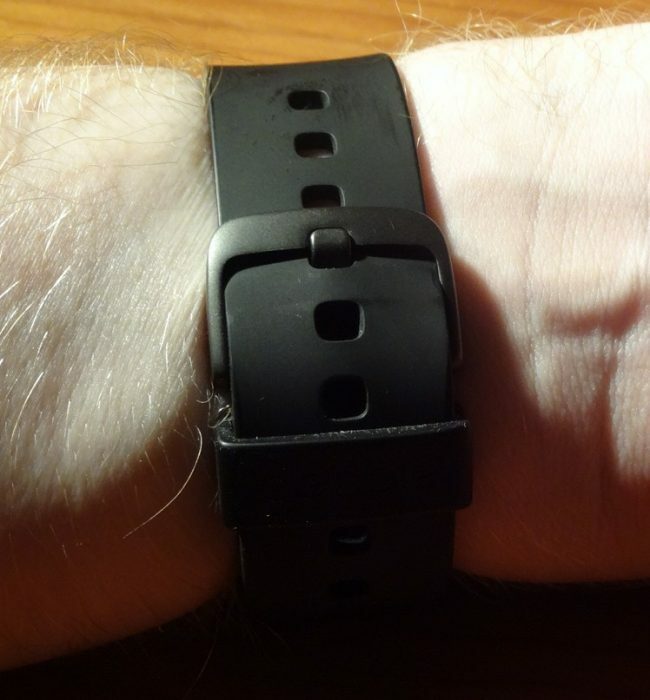 Do you want a notification tool that also works as a basic movement tracker, controls your music and works as a watch that will last for up to 4/5 days on a single charge? If you are answering yes to the above statement, then the Pebble will suit you. However, if you want advanced functions such as maps and navigation, contactless payment, a heart rate monitor, touch input and gestures, voice control and many more advanced features, then maybe you should look at either Android Wear or Apple Watch as your solution. Personally for me, I crave battery life over many of these other things, so for me the Pebble Time was a winner straight away. The thing is though, both the new Pebble Time and the old OG Pebble can do all of the things I have described as being strong points for the Pebble Time, so why not get the old one? Very simply, for the design of the new Pebble Time and the Timeline UI, more-so the design of the hardware though. I like this watch. I think it looks classy, and yet it is subtle enough for people to not really notice it. Think ‘more smart Smartwatch’, and less ‘in-your-face/swag/bling’ or whatever the cool kids are saying these days. All in all, I am very happy with my Pebble Time, and I think that if you were to give it a try you’d find that you would be very happy with it too. Just be aware of its limits. This is great smartwatch as long as you are aware of what it limits are and that it is not an all singing all dancing "look at me smartwatch". Run a website? Time to start making it work on a mobile first.